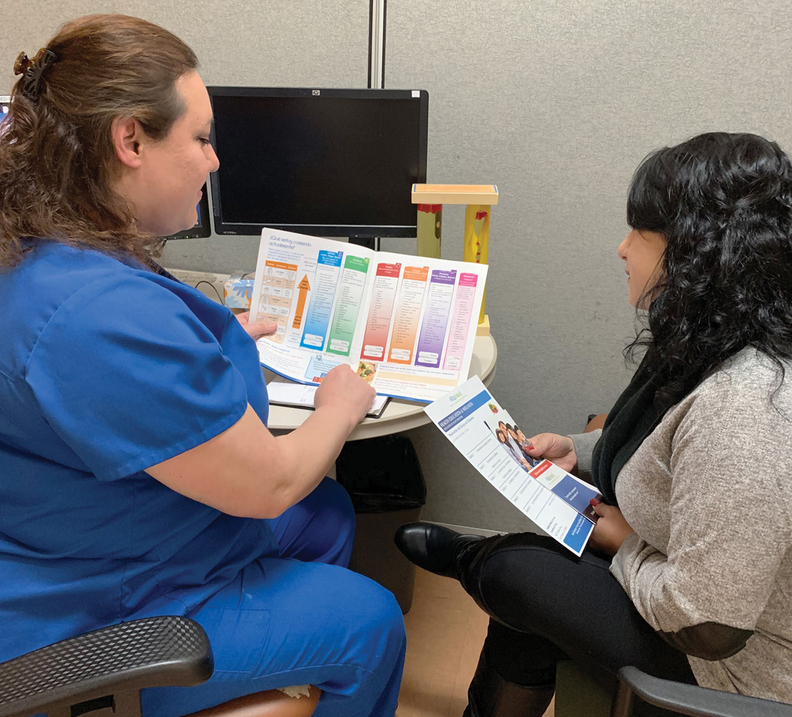 Leticia Solis, a health educator with AltaMed Health Services, counsels a patient on how to better manage her condition. The effort has been part of the health network's strategy since the 1990s to use community outreach to promote wellness. Leticia Solis, a health educator with federally qualified health network AltaMed Health Services Corp., said some of her first experiences with the healthcare system began during her childhood when she was trying to find her parents the appropriate help for their chronic diseases. Both of her parents spoke little English, and money was tight. She said those cultural and economic challenges made it difficult for them to always follow physicians' instructions on managing their health, which made their conditions worse. “I saw my dad and mom struggle a lot economically and I saw that we were in need of some resources,” Solis said. Solis began asking clinicians questions on her parents' behalf and was able to find them social services and other supports. She said playing the intermediary helped her parents better understand what doctors expected while helping their physicians better understand the social factors that hindered them from better managing their health. That help her parents required then to get the best medical care and support is just as important for patients now, something that more hospitals are focusing on, particularly in a time when population health management is gaining prominence. The role of patient advocate has a long history in other countries and has been found within predominantly immigrant populations in the U.S. since the 1960s. But the role is attracting broader interest as the healthcare system has become more complex. For many healthcare providers, the patient advocate has become a more integral piece of their care delivery strategies by addressing both the medical and other factors that impede patients from improving their health. In addition to educating patients, Malone said many patient advocates are finding an increased need to learn more about hospital financial policies to better help patients with billing issues or help them identify resources to obtain healthcare coverage. And the demand is so great that patient advocates hired directly by patients are becoming more popular as a means to navigate the healthcare system. The role of patient advocate can vary depending on how a health system chooses to use their services. Solis of Southern California-based AltaMed fell into the job, in which she provides health education to patients and works to address some of their needs beyond medical care, while keeping clinicians informed of those conditions. When she began working at AltaMed in 2006 as a medical assistant, she discovered a sizable portion of the system's sicker patients were dealing with many of the same socio-economic issues her parents had experienced. More than 60% of AltaMed's 300,000 patients speak a language other than English and 80% are below the federal poverty level. So Solis began applying what she learned through her experiences with her parents, helping her AltaMed patients by giving them information on accessing social services resources. Over time, clinicians at the clinic where Solis worked began noticing improvements in their patients' diabetes and hypertension scores. When they were asked what they were doing differently, patients would mention Solis, resulting in her being promoted to the job of health promoter. Some providers still view their patient advocates as patient relations representatives who mostly handle inpatient complaints about a facility's service or amenities. Other providers have gone beyond that traditional scope, which limits advocates to working on the patient's behalf to settle such issues as billing concerns, answering questions about health insurance, or helping address coverage disputes with health plans. Some advocates also play parts in medical decisionmaking by helping patients and their families better understand treatment options. “Today the navigators I think are a lot more empowered. There is a high level of accountability and a high level of resolution,” said Fouzel Dhebar, administrative director of navigation services at Stanford Health Care in Northern California. Dhebar began at Stanford in 1996 as one of a handful of patient relations advocates whose role back then she described as being fairly limited to that of an unofficial ombudsman to investigate patient complaints about service. Today, Stanford has expanded the duties of the individual advocate as well as the program itself, with a staff of more than 40 that serves every care unit and ranges from information desks to more specialized care navigators who help with scheduling appointments and general support for newly diagnosed cancer patients. “I think our navigators are now the air traffic controllers and really are the glue between the patient, the provider, the caregiver and family members as well,” Dhebar said. Patient-satisfaction scores indicate there is room for improvement in hospital-patient engagement. CMS cost report data from Modern Healthcare Metrics indicate that just 51% of patients in acute-care hospitals strongly agree they understood their care when they left the hospital, though 43% agree that they did. Six percent disagree that they understood their care when leaving. In addition, 87% of patients said that they were given information about what to do during their recovery at home, meaning 13% of patients did not. The changing role that the patient advocate plays at systems like Stanford has been part of a bigger movement over the past few years to reorganize and strengthen their part in the care delivery process, said Erica Rubinstein, vice president of patient experience at Mount Sinai Health System in New York City. Mount Sinai was an early user of patient advocates, starting in the 1960s, a time when, Rubinstein acknowledges, it was traditionally viewed among both patients and clinical staff as the department to send all complaints. A big part of the reorganization effort has involved educating front-line clinical staff to better understand when it is most valuable and useful to call on a patient advocate, Rubinstein said, such as in cases involving more complex patients, or at times when an intermediary is needed to foster communication between different medical care units. Rubinstein said Mount Sinai's advocates are also playing an important role in the system's effort to become the nation's leading model in providing care for transgender patients, who often face higher rates of discrimination in healthcare settings compared with other populations, which has led to larger health disparities. Patient advocates at Sinai are conducting training seminars for staff across the system on how to welcome transgender patients when they arrive for care. Rubinstein believes such role transitions all tie into a change she has observed in the perception of patient advocates among clinical staff, which she said was sometimes confrontational in the past. She described the relationship these days as more cooperative, with clinicians more willing to use the relationships advocates have already established with patients to help them build better rapport.